I was lucky enough to meet a lot of my friends when I DJ’d at KSCU, the college radio station at Santa Clara University. One of those friends, Josipa, had a punk rock show. 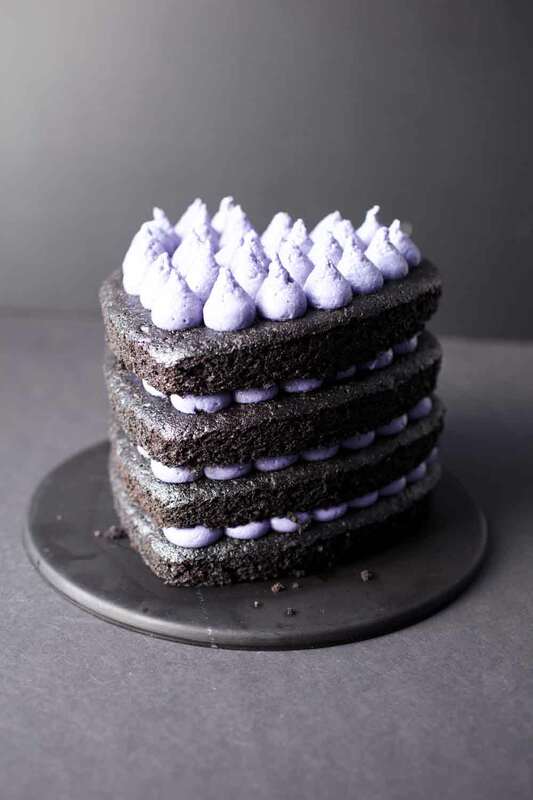 Since the theme of her birthday is a purple tea party, I thought a black and purple punk rock birthday cake would be appropriate. If you don’t have punk rock friends to make this for, it’s also perfect for Halloween! You can also make it cute and goth instead of punk by omitting the spikes. 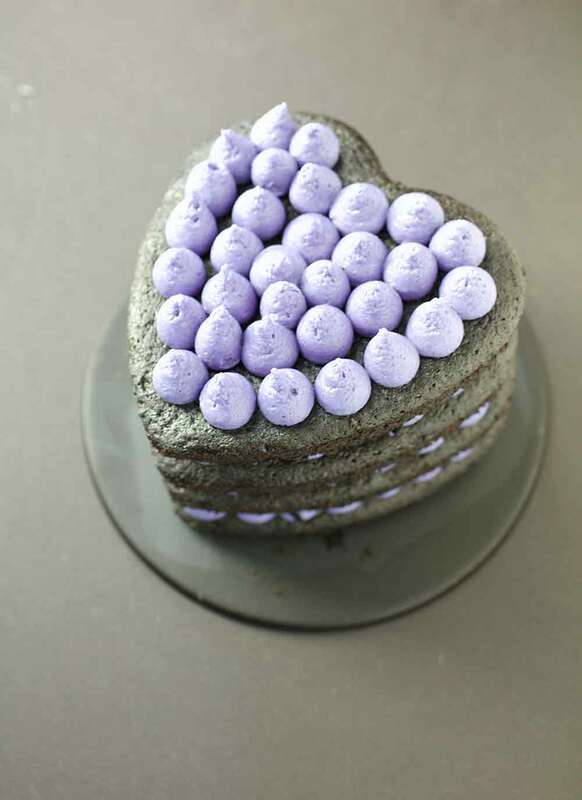 This recipe makes 1 mini black and purple cake (using either three 4” springform pans or four 6” heart pans). Cut a piece of parchment paper for each of your pans by setting the pan on the parchment, tracing it, and cutting it out. Oil all of your mini cake pans, stick the parchment paper in the bottom, and oil the top of the parchment too. This may seem like overkill, but the first time I tested this recipe, the cake wouldn’t come out of the pan, and it ended up breaking. It was catastrophic. I don’t want you to suffer the same undesirable fate. Mix the nondairy milk with the vinegar and let sit. Sift the dry ingredients together (flour, baking powder, baking soda, salt, and cocoa powders) in a medium sized bowl and whisk until it all turns gray. Add the sugar, vanilla, and oil to the milk mixture and mix well. Pour half of the dry ingredients and mix until there’s no visible powder. Add the other half and repeat. 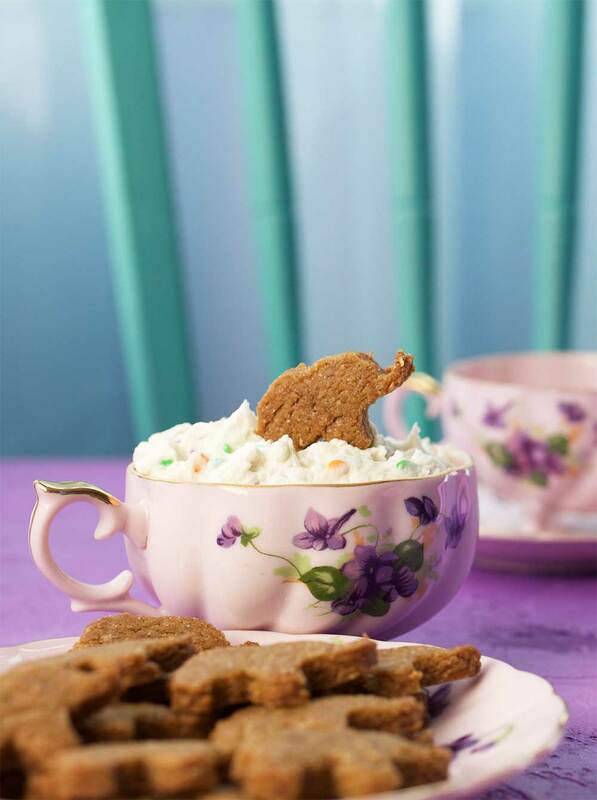 Scrape the sides and bottom of the bowl with a spatula to ensure you incorporated all of the powder into the batter. Mix again. The color should be black when it’s all mixed. 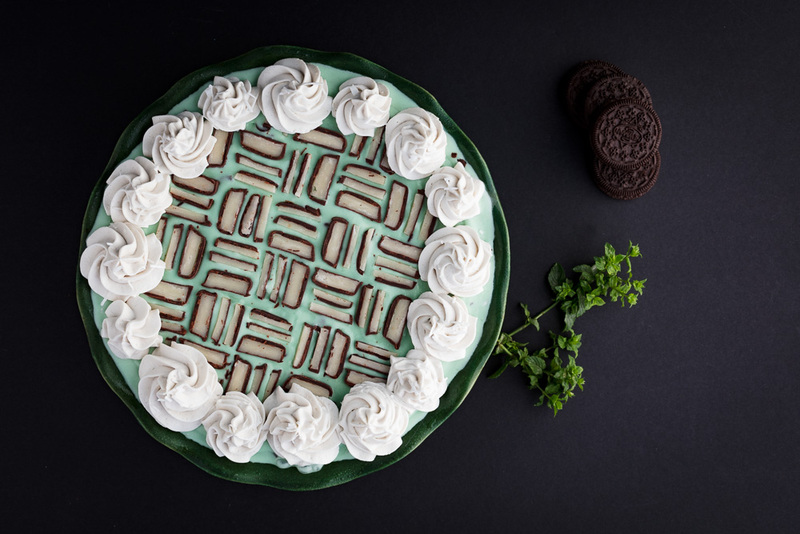 Divide the batter evenly among all of your mini cake pans. I used 4 of the 5 heart pans that come in the set. 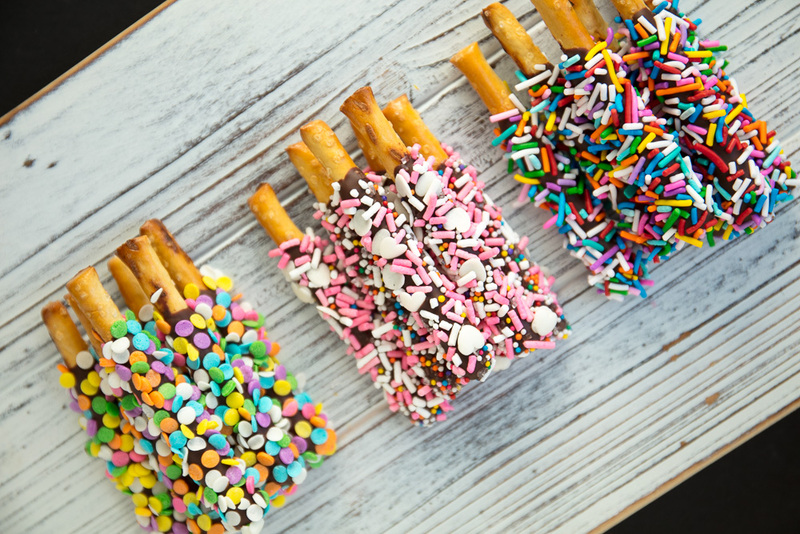 Bake at 350º with all the cakes on the same level rack in your oven. Remove the heart cake pans from the oven after 16 minutes (as long as when you insert a toothpick into the center of a couple, it comes out clean). If you’re using the 4” round springform pans, remove them from the oven after 30ish minutes, when a toothpick inserted into the center of a couple comes out clean. Cool on a cooling rack until room temperature and then chill in the fridge. Add the coconut oil and chocolate chips to a microwave safe bowl. Melt the chocolate chips and the coconut oil together in the microwave for 1 minute and 15 seconds, until when you stir it, it’s completely smooth. 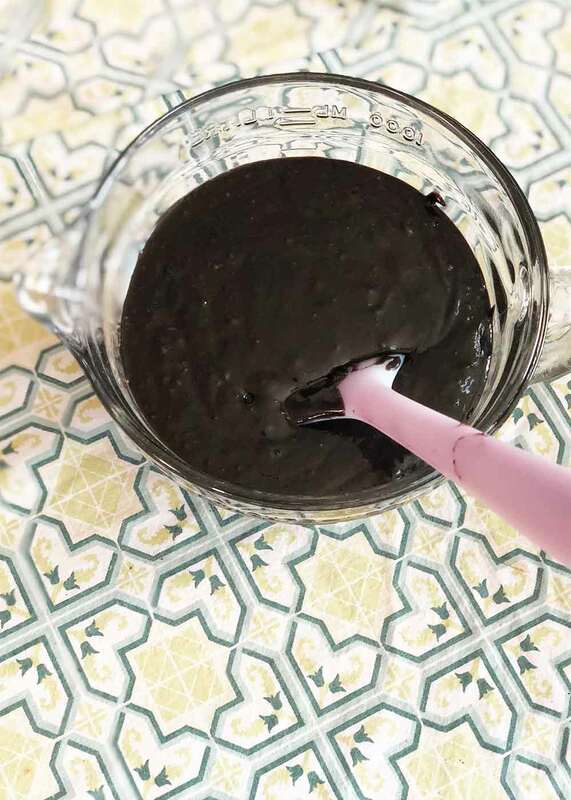 Add the activated charcoal to the chocolate and mix well. Chill for 30 minutes in the fridge or freezer until solid. 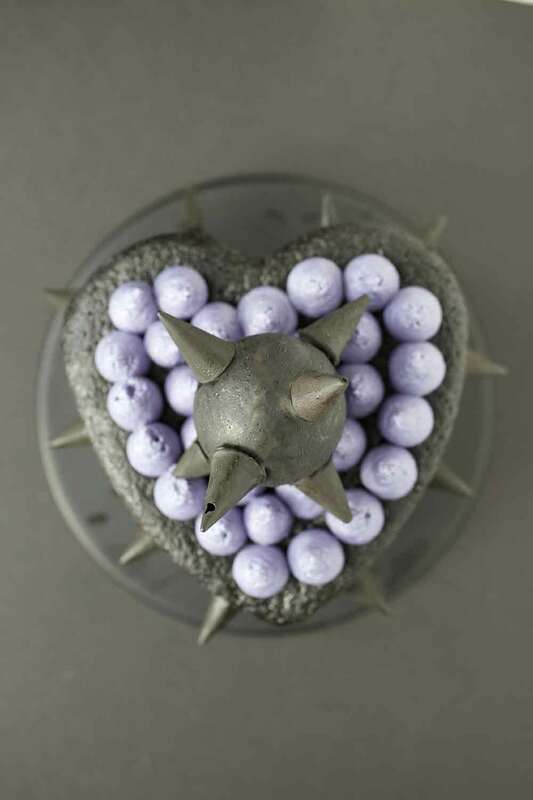 (Optional) If you want to make the spiked ball on top of the cake, you’ll also need this semi-sphere mold. Use purple gel food coloring in the place of all the superfood powders to save time and money. Whisk the earth balance and shortening using an electric mixer and the whisk attachment. Add 1 cup of sifted powdered sugar and whisk for a minute. Add the second cup of sifted powdered sugar and whisk for a minute. Add the chilled blackberry preserves, a tablespoon at a time, whisking between each addition. Try not to add more than 4 tablespoons of blackberry preserves (or jam), so the frosting doesn’t thin out too much. Add the third cup of sifted powdered sugar and whisk for a minute. Add the fourth cup of sifted powdered sugar and whisk for a minute. Add the fifth cup of sifted powdered sugar and whisk for a minute. Scrape the sides and bottom of the bowl with a spatula to get all loose powder incorporated. Add the butterfly pea flower powder and mix well. Add the blue spirulina powder and mix well. Add the pink pitaya powder and mix well. Transfer to a piping bag and chill until ready to use (don’t chill more than 20 minutes or it will become too difficult to pipe). Layer the 4 cake layers with blackberry frosting.